Japanese aviation once again has a loss of face with Skymark Airlines filing for bankruptcy almost five years to the date Japan Airlines did so. But like JAL, Skymark's filing with liabilities of JPY71 billion (USD603 million, a fraction of JAL's USD25 billion filing) may prove to be the best option forward, and a chance to emerge stronger. (The carrier will be de-listed but remain flying.) Skymark's filing was accompanied with resignation of Shinichi Nishikubo. He was more than Skymark's CEO and largest shareholder: he took a deeply personal vested interest and ran the company top-down. Skymark without Mr Nishikubo is a scenario many employees could not have imagined. But this is an opportunity. Skymark now has a tabula rasa. Mr Nishikubo used Skymark to crusade against legacy incumbent airlines, creating friction when there became a need last year to have a logical codeshare with those same incumbents. Initially a revelation in the Japan market as a successful LCC, Mr Nishikubo's involvement, such as personally making Skymark's IT systems or deciding on the A380 purchase, sacrificed Skymark's strategic value and chance for development. Skymark must now decide what its future is, and without Mr Nishikubo Skymark there is no predestined direction. Routes will be cancelled and the A330s withdrawn. Skymark has a foundation to build on, and finally being able to create a sound strategy should rightfully see investors line up. Skymark was established in 1996 and commenced service in 1998. In Jul-2014 Skymark reported a "going concern" to its operation and in Oct-2014 reiterated there was "material uncertainty" over its future. Its stock price plunged but gained on speculative reports AirAsia would step in. In its bankruptcy filing Skymark attributed its situation to many elements, including this statement about its A380 contract: "The company, believing the demands for breach-of-contract payments were unreasonable, attempted to negotiate a reduction in the payments with Airbus but reached a situation in which there were concerns that payment for breach of contract would have worsened the company's financial base." It finds itself in bankruptcy due to a number of circumstances. These are outlined briefly below and in this report will be examined in greater detail. The conclusion will look at Skymark going forward. Aircraft: Skymark's order for six A380s carries a financial liability not included in its bankruptcy statement. Including further A380 liabilities, the Japanese media expects Skymark's liabilities to surpass JPY100 billion (USD849 million). But it would be wrong to rest Skymark's problems on the A380 alone. However this is likely of little consolation to Airbus, which will have to contend with misguided statements that Skymark was bankrupted by the A380. Distraction: There was also the very significant impact of these A380s distracting management. This resulted in the A330 introduction being delayed, racking up expenses. Strategic initiatives had to be put on hold, such as a loyalty programme that would have increased Skymark's appeal just as it was introducing a leading and affordable new product in the market. Also postponed were partnerships that could have increased revenue and even assisted Skymark to abandon the A380 purchase plans before two aircraft were assembled. Growth: It is not entirely accurate for reports to say Skymark was struggling to fill seats. It is true and very much a problem that Skymark's load factor decreased. But this was the result of growth that was too much, too fast. Skymark was able to increase passenger numbers, reinforcing its underlying potential, but put too much capacity in the market. Position: Since the entry of the new (and arguably, "true") low-cost carriers, Skymark has struggled to position itself. Its A330 domestic product was superior to ANA's or JAL's, but Skymark also hoped to maintain relevance to the budget end of the market. This was unfortunately mis-communicated in a now-infamous remark that Skymark would not respond to complaints or help passengers stow luggage. Skymark proved unable to compete with the new LCCs and withdrew its routes from Tokyo Narita, where the LCCs are now ensconsed. Skymark has been short on admitting its own failures. For example, the carrier has attributed much damage to the yen's depreciation, a topical choice given the contentions on the subject at home in Japan. The Wall Street Journal quoted new chairman Takashi Ide saying: “When we made the contract with Airbus, the yen was around JPY80 (against the dollar)...Then the yen weakened rapidly to JPY120, inflating the cost (of the A380 deal).” Whatever the case, most prudent airlines would have covered themselves with a currency hedge for such a high risk commitment relative to Skymark's capitalisation. However, the strategic shortcomings of the A380 project for Skymark were significant and far outweigh any change in currency. It is questionable if Skymark could even have made the A380s work exclusive of acquisition costs, which would exclude the yen's impact on purchase price (but not fuel). The financial impact of the A380 on Skymark is not entirely clear. Skymark in Jul-2014 said it had already paid JPY26.5 billion (USD225 million) in pre-delivery charges to Airbus and Rolls-Royce, the engine supplier. Skymark also had an A380 simulator and would have paid other costs relating to the A380. The Japanese media said Skymark's further obligations for the A380 could be as high as JPY70 billion (USD595 million). Airbus in Dec-2014 filed an undisclosed complaint in London. Skymark said it sold the simulator and spare engines but did not state the price, or likely loss. The origins of the 2010 A380 order (for four and a subsequent two aircraft) are pegged almost solely on Mr Nishikubo and throughout the A380 project, managers – at the airline and later Airbus – had doubt. Skymark, which had mostly operated 737s in the domestic market, wanted to fly A380s to London, Los Angeles, New York and Paris. CAPA has written previously on this plan's challenges, but to summarise: Skymark had no international, let alone long-haul, experience, had no partners in a JV-dominated world, nor IT that could not support partnerships, no frequent flyer programme that would create stickiness in the corporate market, little feed at Tokyo Narita, was an unknown brand outside of Japan, challenging all-premium configuration, and planned using the largest passenger aircraft possible to start international experience. In short there could not have been more wrong with the decision. In comparison, in Japan's new market, ANA and JAL are not even using 747s for long-haul flying. There are a handful of 777s, but the two are relying more so on smaller 787s. The chance to make the A380 long-haul operation work was small and dependent on relatively seismic changes for the carrier. These did not eventuate and in Jun-2014 CAPA warned: "It is now too late for Skymark to implement all of these changes in time for a stable A380 launch in Dec-2014 as it last planned. Skymark needs to consider delaying its A380s or contemplate whether it can endure – and survive – what will likely be significant losses." Skymark in Jun-2014 announced about a six month delay to its A380 due to interior fit-out delays. These are understood to be have been genuine and are impacting other operators, notably Qatar Airways and its A380, but also prevented Airbus from installing a costly interior it may have had to remove. Following media reports in Jul-2014 that the order was in limbo, Skymark on 29-Jul-2014 issued a statement from CEO Shinichi Nishikubo that sought to deflect attention away from its over-ambitious plans and onto Airbus. Since the statement, in which Skymark said it was reviewing options, Airbus has said the order was definitively cancelled. Skymark said it had been in discussion with Airbus since Apr-2014 about changing the order due to "the deteriorating management environment from weak yen and harsh competition". Airbus proposes a condition for us to go under wing of a major airline company in order to change the contract of aircraft order. However, "Negotiation is not making good progress," Mr Nishikubo said, explaining, "It is mainly because Airbus proposes a condition for us to go under wing of a major airline company in order to change the contract of aircraft order. Otherwise the aircraft maker needs us to pay outrageous amount of penalty beyond our common sense." The reference to "go under the wing of a major airline company" likely refers to a partnership, joint venture or alliance, which CAPA has supported in the past. Delta, for example, does not have a trans-Pacific partner and was likely interested in working with Skymark but has lost interest and is now pursuing Korean Air. In the absence of clarification, it could also refer to the possibility of joining with another Japanese airline. With Skymark refusing a partnership, Mr Nishikubo said, Airbus wanted an "outrageous" cancellation fee "beyond the realm of common sense". Reports in Jun-2014 questioned Skymark's ability to remain independent, and Skymark rejected them at the time. Skymark once again maintained that it should remain independent, Mr Nishikubo stressing that independence is Skymark's "raison d'etre" and that "the proposal which shakes our independence of management is totally unacceptable...it is beyond our consideration to go under the umbrella of other companies." Faced with an uncertain operational deployment, Skymark was reportedly having difficulty financing the aircraft, according to Les Echos, which said Skymark wanted to fund the aircraft from operating profits rather than debt (Skymark is debt free). This became challenging as Skymark's finances weakened in face of new competition in the Japanese domestic market. Skymark for the year to 31-Mar-2014 reported its first loss in five years. Further, it is understood leasing options did not eventuate. The A380 was negative to Skymark for the distraction it posed. It should be emphasised this is a not a problem inherent to the A380 (and nor, by all accounts, was the transaction the result of a sales push by Airbus, which apparently played a cautionary role throughout). Rather the fault was Skymark's inability to manage the aircraft. Skymark planned to transition from being an all-narrowbody domestic operator to taking two new widebody types in a year. And further, this would be in Japan, where Skymark rightly or wrongly perceived the aviation authorities to be biased towards ANA and JAL. The A380 distracted management, one outcome of which was a nearly three month delay to the A330's introduction, accumulating costs as the A330s did not fly commercial services but incurred lease and other payments. Management had to postpone projects including a loyalty programme, which would have strengthened its proposition in its core domestic market. Inevitably the over-capacity in the domestic market was not watched and rectified as quickly as it should have. Skymark also did not have the management bandwidth (or IT infrastructure) to consider partnerships. Even with only a domestic network, these could be valuable. There are carriers without a strong local Japanese partner or airlines with an existing partnership that would like an alliterative partner, one that could offer lower behind gateway access. SkyTeam has a void in Japan, and in particular Delta is without a Japanese partner (American Airlines is with JAL and United with ANA) or any trans-Pacific JV relationship. This could have been worth exploring. What is probably under-appreciated in the Skymark saga is that at the same time it was dealing with challenges from its new projects – the A380 and A330 – its domestic market was in turmoil, further weakening Skymark's financials. This had not been the case prior. Skymark posted profits in 2007 and again from 2009 to 1H2013. Net profit (loss): (JPY13,676 million) (USD132.8 million), from previous forecast of a profit of JPY354 million (USD3.4 million). On 29-Jan-2015, Skymark said a revised FY2014 loss of JPY13.7 billion (USD137 million) would likely be greater. Skymark, in the six months to 30-Sep-2014, burned JPY2.5 billion (USD25 million) in cash reserves. Cash and near-cash items on 30-Sep-2014 were JPY4.5 billion (USD38 million), down 75% from a year earlier, according to Bloomberg. 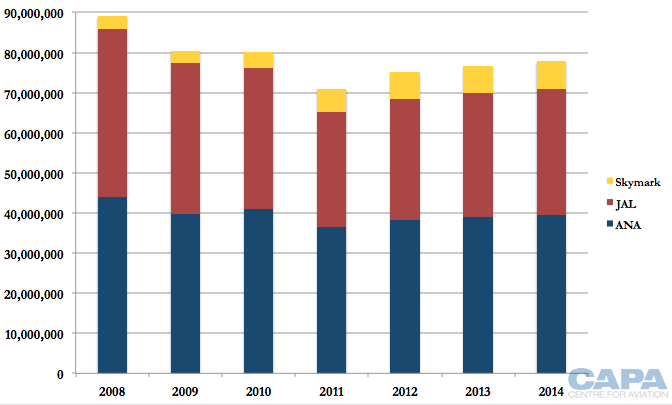 Skymark commenced aggressive growth in 2010, increasingly nearly 2.5 times in three years. 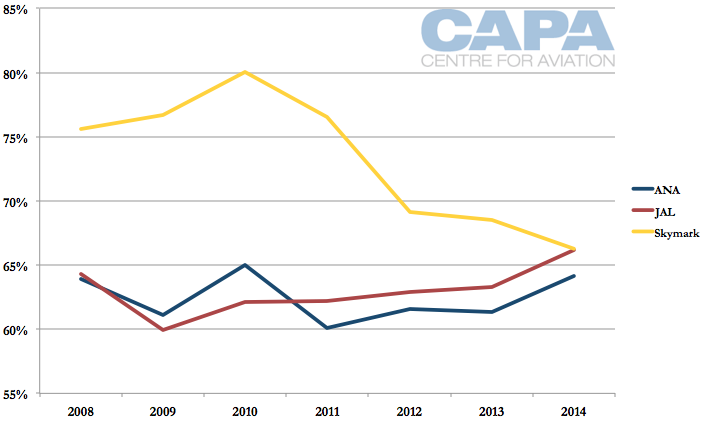 Capacity was added ahead of demand and Skymark's load factor fell from a peak of 80% in in calendar 2010 to 66% in 2014. The addition of widebody A330s, increasing capacity without always decreasing frequency, helped exacerbate the situation – but Skymark had an over-capacity situation even before the A330s entered service. To taper the capacity situation and streamline its fleet, Skymark will now withdraw its A330s in Feb-2015. A follow-up CAPA report will examine this topic. The future poses a concern. 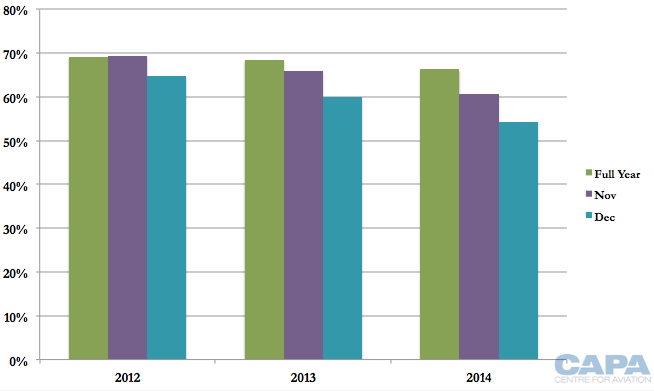 Skymark's load factor had a year-on-year decrease in nine months in 2014. Of the three months that saw gains, two of those months had a gain less than 1ppt and one had a gain of 2ppt. 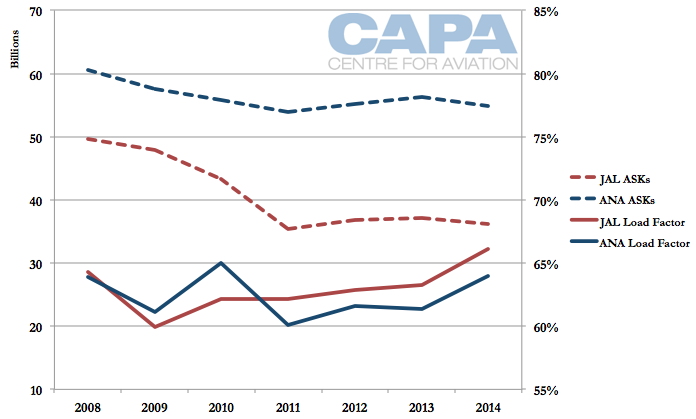 Overall, Skymark's 2014 load factor was 66.2%, down from 68.5% in 2013. The end of 2014 shows worrying signs. 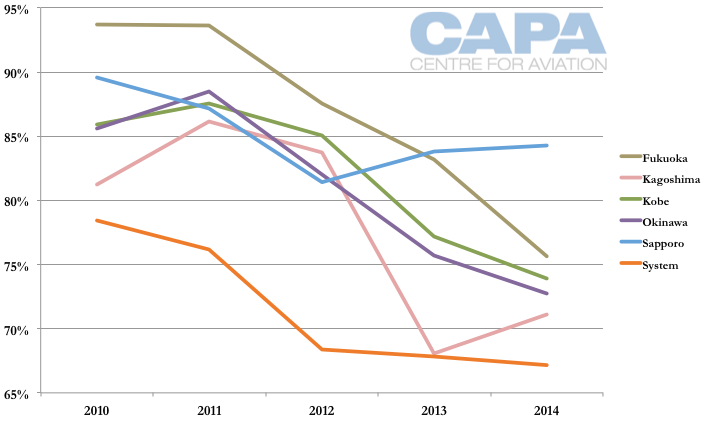 In recent years Skymark's November and December load factors were understandably lower than the year average. But the rate of decline appears to be increasing. 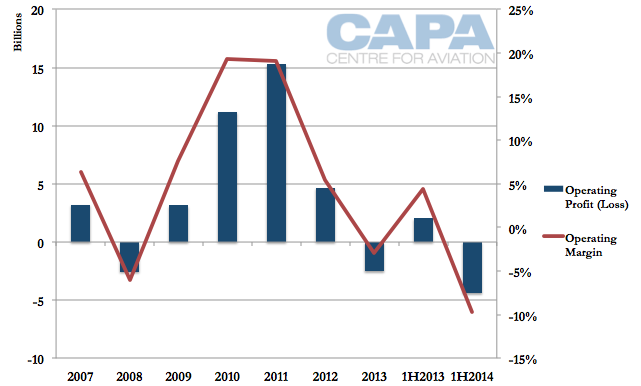 In 2012, the gap between full-year load factor and that in Dec was 4.3ppt. In 2013 the gap was 8.4ppt and in 2014 11.9ppt. This is despite route cancellations implemented in Nov-2014. Without action, early 2015 performance could be bleak – even without factoring in any negative consumer sentiment from the bankruptcy filing. Skymark has a lower operating cost than ANA and JAL, but requires a higher load factor to offset lower average yields. This is typical of a low-cost challenger and at first Skymark delivered: Skymark had a comfortable 10ppt gain in load factor over ANA and JAL, and in 2010 even had a 15ppt gain over ANA and an 18ppt gain over JAL. The gains were almost embarrassing, but soon ended: in CY2014 Skymark's load factor was the same as JAL's and only 2ppt ahead of ANA's. Skymark's deteriorating load factor was exacerbated by ANA and JAL increasing their efficiency: ANA and JAL increased their load factors as they reduced capacity. The saving grace is that ANA and JAL are anxious to maintain yields; if they were to accept a higher load factor for lower yields, Skymark would be gravely challenged (as would a number of other airlines). It is true Skymark was impacted by the yen's depreciation, which increased USD-denominated fuel costs. But it would have taken a very large appreciation to potentially offset the capacity Skymark injected. Skymark's pre-existing domestic network was impacted by mounting losses at its Tokyo Narita operation, which is where LCCs also are. Skymark posted a JPY2,506 million (USD25.0 million) FY2013 loss, and in the first nine months of the financial year lost JPY3,449 million (USD32.7 million) at Tokyo Narita alone. Further Narita financial figures have not been disclosed but Skymark withdrew from its Narita operations in Nov-2014. On 21-Jan-2015, Skymark announced that from 29-Mar-2015 it will suspend Sendai-Sapporo and Ibaraki-Kobe-Yonago services. From Tokyo Narita, LCCs serve three of Skymark's (now former) Narita routes: Fukuoka, Okinawa and Sapporo. These were also Skymark's largest losses at Narita, but need to be measured against capacity. LCCs from Narita do not serve Asahikawa, Ishigaki and Yonago. Where Skymark competed with LCCs, it could not lower its cost base. Where Skymark did not compete, it did not have a cost base low enough to stimulate demand on thinner routes. Skymark cannot compete with the LCCs based on price and nor does it have the business model yet to attract the passengers ANA and JAL do. Skymark remains stuck in the middle. Tokyo is making one of its boldest interventions yet in Japanese aviation by orchestrating a tripartite cooperation that will involve rivals All Nippon Airways and Japan Airlines codesharing with Skymark.Japan's third largest carrier, Skymark was earlier this year forced to withdraw from an over-optimistic plan to take six A380s. That left Skymark with an enormous penalty on top of the larger than expected start-up costs for its A330s. Tokyo aims to ease Skymark's current deficit by having the ANA and JALcodeshares boost Skymark's revenue. The codeshares as envisioned will not directly address Skymark's daily costs or the A380 penalty. The codeshares are due to be on five of Skymark's routes from Tokyo Haneda that collectively accounted for 46% of Skymark's Oct-2014 capacity. Load factors in recent times have dipped – not due to falling passenger numbers but because expansion has been leading demand. An important question is what happens after the five year codeshare, when ANA and JAL passengers have experienced Skymark's cheaper, and in some cases, better product. Skymark in coming years could enhance its offerings – loyalty, partnerships, corporate contracts and even alliance membership – and then seek to keep ANA and JAL passengers once the codeshare is over. ANA and JAL must balance appeasing Tokyo while potentially empowering a competitor. There are numerous details, including the specific routes and limits on how many codeshare seats could be sold, but it would have been helpful as Skymark entered what were now its death throes. The urgency changes now that Skymark will end A330 services in Feb-2015, immediately reducing overall capacity. Skymark's Haneda routes (on which the codeshare would have focused) perform better for Skymark than its average. That would have left Skymark to address other areas of its network as well as other cost-cutting and revenue-generating matters. It was reported ANA would consider taking equity in Skymark, although ANA denied this. On 15-Jan-2015 the Japanese press reported Skymark and ANA failed to reach an agreement on a possible funding deal. Skymark was optimistic about pulling itself out of the red as it had reportedly found alternate sources of revenue that would have allowed it to continue to operate until late Mar-2015, after which it expected a steady revenue stream from codeshares with ANA and JAL. Bankruptcy however indicates that was not the case, although Skymark said Tokyo-based private equity firm Integral Corp had agreed to provide financing to help Skymark restructure, pending court approval. Skymark hoped the selling of the A380 simulator and spare engines, early lease return of aircraft and corporate discounts would shore up revenue. In a handful of years Skymark has gone from cash rich to bankrupt. Unlike other bankruptcies or collapses, there are almost no external shocks Skymark can rightfully claim. Claims of yen depreciation are a stretch; the A380 operation was going to be difficult ever since the contract was signed, and Skymark made no strategic improvements that would have given it a fighting chance. Mr Nishikubo turned Skymark around but also nearly brought it to its end. While this a challenging time for Skymark, the airline has a future. Mr Nishikubo's early work and ethos should be remembered. He created a genuinely lower cost airline in Japan that others maintained was impossible; but it is right now for him to depart. He has left as CEO and a director of the company. He held a 30.56% share in the company. Now to the future. Skymark has a following and, more tangible, the third-largest (after ANA and JAL) share of slots at convenient (and slot-restricted) downtown airport Tokyo Haneda. Skymark holds 36 slot pairs at Haneda. The mere existence of these slots ensures Skymark has a future, unless the regulator makes the unlikely decision to strip Skymark of them. Without the slots there would be little left (the aircraft are all leased) although Japan is eager to ensure there is competition for ANA and JAL, hence the support for the codeshare. Skymark's bankruptcy will highlight certain arguments that Japan's aviation deregulation has been ineffective: while there have been a number of new entrants, they eventually had to rely on support (typically from ANA) to remain in business. Tokyo's objective of competition for ANA and JAL remains relevant. This policy would be especially positive if Skymark, under a new management and strategy, had a capital-light international aspect that would bring home-bred competition to ANA and JAL in international markets. This would align with Tokyo's strong growth targets for international inbound tourism to boost revenue. Reports indicate there is substantial local interest in Skymark. Inevitably, AirAsia's name was thrown up as a possible suitor. It would certainly be a question if AirAsia wanted to turn around a hybrid airline (not an easy task in any environment, let alone the difficult Japan system), but perhaps redundant since Tokyo is unlikely to favour an outcome that would place Skymark in foreign hands. Then again, creditors will have a large say in Skymark's future: Airbus is a major player and good friends with AirAsia. The genesis of AirAsia Japan Mk I was originally a partnership between Malaysia's AirAsia and Skymark, but eventually ANA came into the picture to head off the threat of such a strong combination. Peach Aviation has indicated it would like to use the under-utilised nighttime international slots at Tokyo Haneda that the country is making available to LCCs. Peach – and any others – will surely use nighttime slot success to argue for daytime domestic slots when they become available in a few years. Cost-efficient competition at the airport in Japan will require significant re-orientation from ANA and JAL, such as by finally boosting load factors with lower-priced tickets. 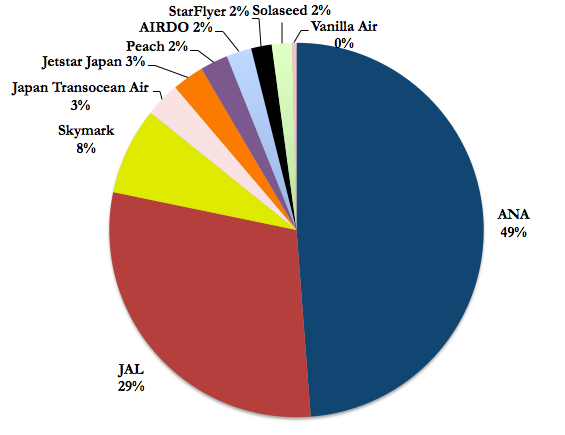 With ANA and JAL having a minority interest in respective LCCs Peach and Jetstar Japan (ANA fully-owns Vanilla), they will need to rely on regulatory – not board room – action to stop this. It was inevitable, as CAPA has suggested, the new LCCs would aspire to fly from Tokyo Haneda. It will be sometime before they have a chance at the domestic daytime operations most appropriate for domestic operations, but the clock is ticking. That makes Skymark's turnaround all the more imperative. Skymark must hone its strengths. It cannot be everything to everyone. Its ability to compete with LCCs is clearly limited. Skymark should focus on moving up market, as well as explore new avenues: the corporate sector and, to a lesser extent, international partners. 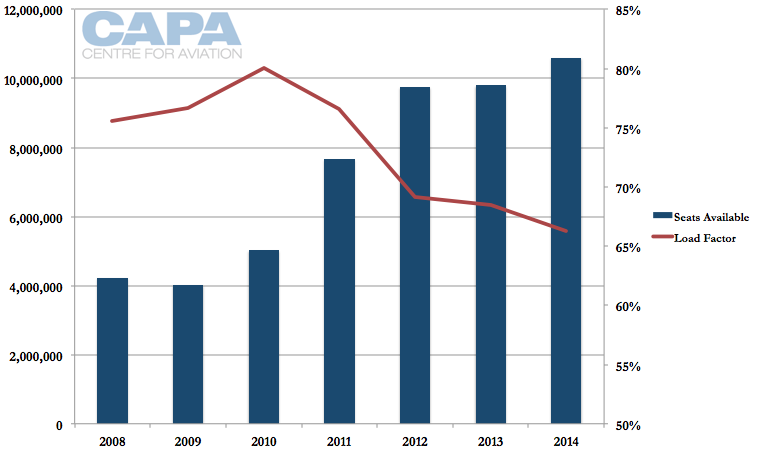 CAPA has advocated this for some time, if only partly because paring costs to the new LCCs' levels will take considerable time. The challenges of Skymark's bankruptcy filing should not be under-estimated, either in the short-term or long-term, as shown by the continued restrictions on JAL and animosity towards it from certain parties. But it seems unlikely Skymark would have changed under its previous leadership, so this finally presents an opportunity for Skymark to make a meaningful transition. Skymark's former CFO Masakazu Arimori now has the reins, and there is much picking up to do. Leadership was seldom cultivated at Skymark and the airline has unfortunately lost many valuable employees. Job cuts are not envisaged – yet. A turnaround may not be as heroic as JAL's, following its 19-Jan-2010 bankruptcy filing, but Skymark's will still be challenging – and potentially rewarding. The Japanese market has many nuances that make it unique. Skymark not only has a role to play as an independent airline, but can have a more meaningful one in the future than it has had in the past.